Vince Carter and the Dallas Mavericks made sure this one was decided early. "We were locked in from the jump and we didn’t have to play catch-up, and I think that’s good for our team," Carter said. "We had to bring more energy and we had to do it from the beginning. We had to hit those guys first because they do a great job of trying to take teams out of their game early." "Whenever you feel too good about yourself somebody smacks you," Gibson said. "That’s a part of the NBA." Dallas continued to pull away early in the second quarter, using a pair of four-point plays — one each by Nowitzki and Jae Crowder — to stretch the lead to 43-23 less than 4 minutes into the period. 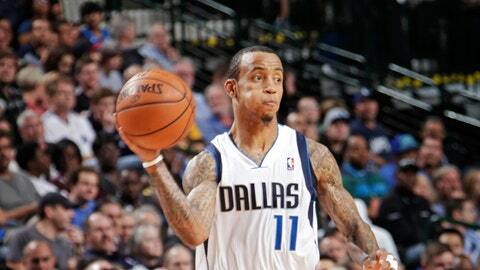 The Mavericks led by as many as 29 points before taking a 61-34 advantage into halftime. The Bulls gave up plenty of points, but much of their first-half woes came on the offensive end. They didn’t manage to score 20 points in either quarter, going 14 for 36 (38.9 percent) from the field and committing 13 turnovers in the first half. "When he plays the way he played, we’re a whole different team," Ellis said. The Mavs led 86-56 entering the fourth quarter and it appeared the final 12 minutes would be extended garbage time, but the Bulls made things a bit interesting by scoring the first 16 points of the period to pull to 86-72 on a three-point play by Noah with 6 minutes remaining. NOTES: Bulls F Luol Deng missed his fourth straight game with a sore left Achilles. Deng said he wants to make sure the injury is healed before he returns so he doesn’t have a setback. "In the past, I would’ve been out there and playing and then missing another month or so, and I really don’t want to do that," he said at the morning shootaround. … Nowitzki had six field goals to reach 9,002 for his career. … Dallas F Brandan Wright returned after missing a game with flu-like symptoms, but G Wayne Ellington sat out with flu-like symptoms. … In their 11 wins, the Bulls have held opponents to an average of 82.5 points.